While driving in the early morning hours in my beloved city of Atlanta, I saw the usual signs of city growth: traffic that can make a Nun cuss, shiny new buildings, massive construction everywhere, people bustling off to work, school and the airport, and homeless people huddled under bridges. 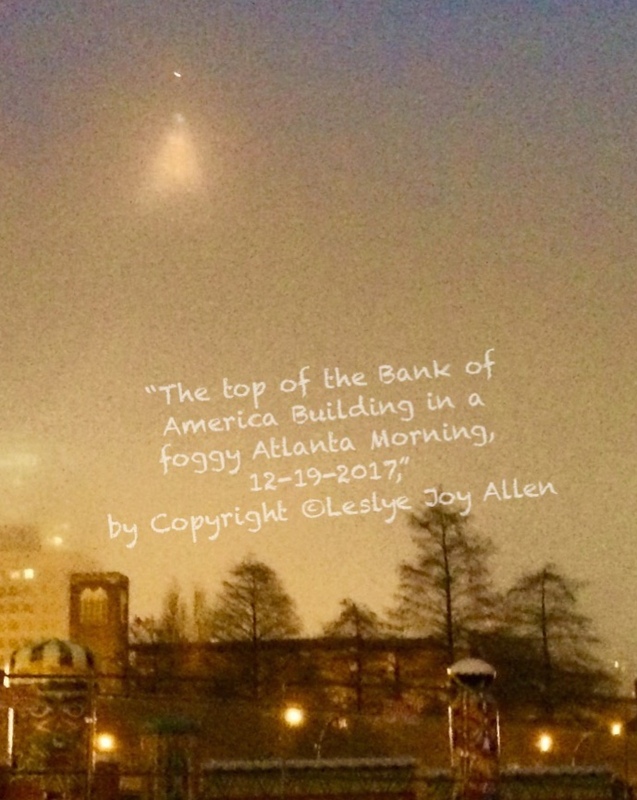 When I witnessed the top of the super large Bank of America Building on Peachtree Street, its steeple-shaped illuminated top seemed to hang in the air in our unusually heavy fog. If I did not know anything about this building or if I was a kid with a vivid imagination, the sight of that lighted steeple would have given me the best fantasies of flying saucers and aliens. Puerto Rico, Dominica and St. Johns, Virgin Islands still have no electricity. There will be no Christmas lights and there probably will be no lights on New Years’ Eve. These tan and brown and black human beings have been without power for over 14 weeks at this writing. And just like the homeless in downtown Atlanta, many folks stay on these islands to protect what little possessions that they have left after hurricanes. They take cold showers when they can, and eat food prepared from makeshift kitchens. You may not give a damn about any of this because it doesn’t directly affect you, but it actually does. You may not care about all of these people of color, but you will because they are necessary in ways you may never have imagined. Remember, no one gave a damn about a homeless brown couple–with the wife being very pregnant–in Bethlehem over two thousand years ago, either. For much of the past year, many of us have whined and moaned about the current state of affairs in Washington, D. C. We have often exhausted ourselves with tales of political misconduct and malfeasance and sexual impropriety. We have listened to racist, sexist, homophobic, and misogynist rhetoric. And at times, I have to say, I wondered when (or if) anyone was going to get tired of feasting on all of it. It’s not that these evil things don’t exist; they do! Yet, in our well-meaning attempts to publicize many of these problems, we often perpetuate our own lack of resolve to change any of it simply by believing that ranting about it on social media does anything more than help us blow off some steam. We often forget that much of this nation is built off and on the backs of people who now lay on the streets in cities all over the nation and throughout Latin America and the Caribbean. In 2018, let’s plan to get out and stay out of the fog long enought to recognize the rest of the building; and that the top cannot and never has stood without the support from all those floors and a steady foundation. That’s it for the year folks. If you didn’t understand this post, I’m sorry, but that’s it. I’m tired, happy, at times anxious, exhilarated by our capacity to triumph, glad about the women who no longer ask permission to be great or to do the work they were born to do. I know we can change anything we want to change. But we can’t do any of it in a fog. Peace.